I have a bit of a history with the Long-eared Owl. It was the first species of owl I ever observed in Manhattan, when a trio came to the pines atop Cherry Hill in February 2011. It was a bird I missed in my big year when a single such owl appeared in Strawberry Fields on 17 October 2012 and no one reported it in time for me to see it. This owl chose to linger for only a single day (as far as we know), which is a little unusual. Records on eBird indicate that when a Long-eared Owl comes to Central Park, it usually stays for at least a few days at the location where it was seen, though owls that arrive alone tend to be the exception. Another lone Long-eared Owl was seen by many this year, on 18 December 2013, in the pines southeast of Turtle Pond and just south of the 79th Street underpass. This one was reported quickly, on Facebook, but I was not around to see it. It was not found again the next day. Yesterday, 27 December 2013, three Long-eared Owls were found in the pines of Cherry Hill. Today only one was visible, and it could be seen only partially and with difficulty. This was species number 199 for me on the year in Manhattan. 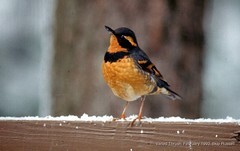 The Varied Thrush is a special bird for me. I will always remember the one that showed up in the Central Park Maintenance Meadow on 28 November 2010. This was, coincidentally, the first day I ever went birding. I did not know about it until my second birding walk, when I happened to wander through while many photographers and birders were trying to find it. I wrote about this bird in Chapter 4 of my book. This Varied Thrush drew birders day after day, and it amazed everyone by lingering in the same general area for five months, disappearing in mid-April 2011. Birders doing the Christmas Bird Count for the Stuyvesant Town area found a Varied Thrush near the corner of 20th Street and First Avenue on this past Sunday, December 15. This is the first Varied Thrush reported in Manhattan since the one in Central Park mentioned above. In the following days the bird has been appearing on the Stuyvesant Town Oval and near adjacent building #11. This one is a vibrant male. The one in Central Park was a female. The bird is generating a lot of excitement among birders. It would generate even more were it not for the 2010-11 Central Park Varied Thrush, which put the species on nearly every local birder’s list. Brooklynites had a Varied Thrush appear in Prospect Park this year in March. I went to see it on 17 December in the early afternoon. It became species #198 of the year for me in Manhattan.